Updated 9th Nov 2010: This restaurant is closed according to Urbanspoon.ca. We booked a seating to a seafood restaurant. 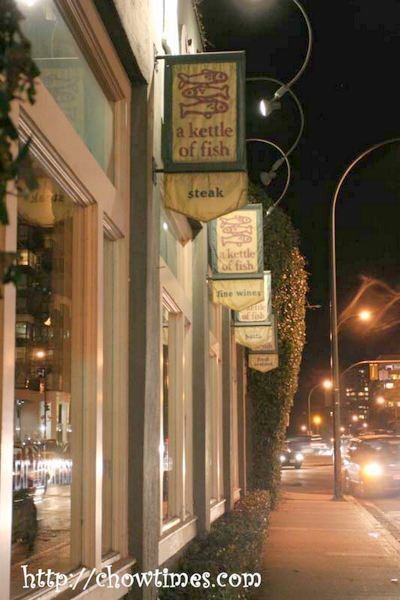 A Kettle of Fish, or more affectionately known as “the Kettle” is located on 900 Pacific St on Hornby in downtown Vancouver. 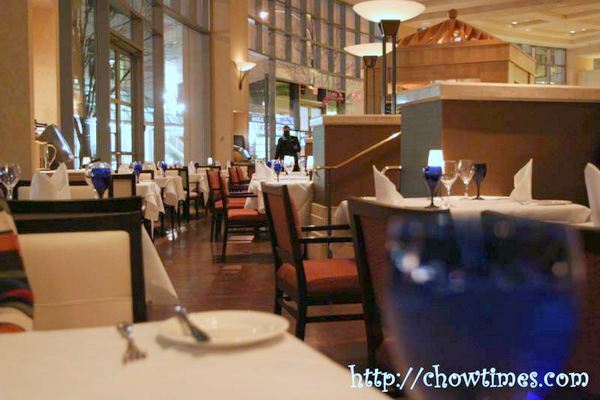 The Kettle is known as perhaps one of the best west coast style seafood restaurant in the city. Although their menu consists mainly of seafood, they do have limited selection of meat and pasta. The names of their dishes off the menu reads of lobster, sockeye salmon, tiger prawns, scallops, dungeness crab, clams, mussels, artic char, tuna, alaskan black cod, and so on. Doesn’t that make you hungry? For once in this year DOV events, we have sort of graduated from “water only” meal to … Virgin Margarita! 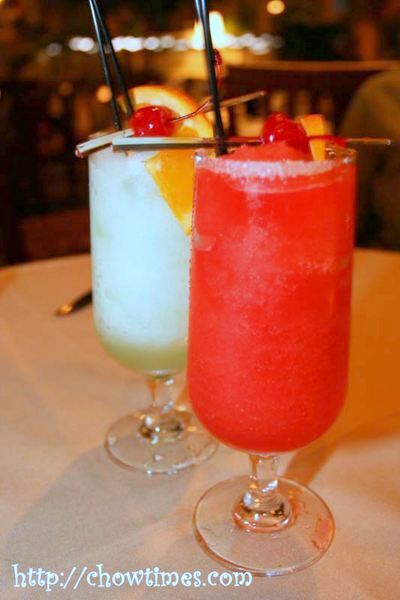 🙂 I had the Virgin Strawberry Magarita which is sweet and served in a sugar coated glass rim. Suanne ordered the Virgin Lime Magarita. It was lightly salty and and tastes like plum juice. 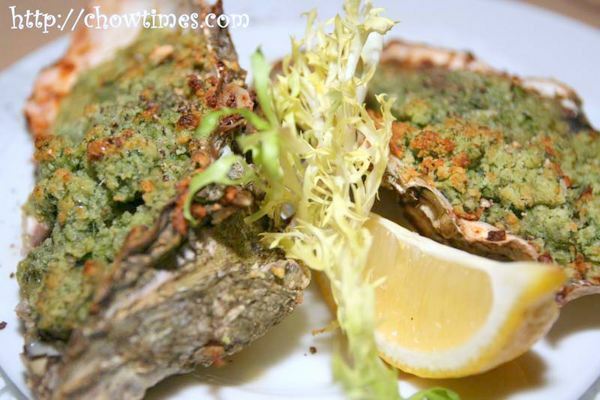 One of the appy we ordered was the Oven Baked Oysters Rockefeller with Spinach, Pernod Scallions and Smoked Maple Bacon. There are two large succulent oysters which taste reminds me of cockles which I like a lot. This is good especially with a squeeze of lemon on the crisp topping. The other appetizer is what is known as the Pear, Celeriac and Irish Cashel Blue Cheese Vichysoisse with Creme Fraiche and Chives. Well, it’s easier for everyone if they name this simply soup. The soup is rich with a sandy texture. This is probably due to the mashed pear in it. We went to the Sequoia Grill at the Stanley Park for our next Dine Out Vancouver 2007 event. I’ve always enjoyed the drive down wide Georgia heading to the world famous park. 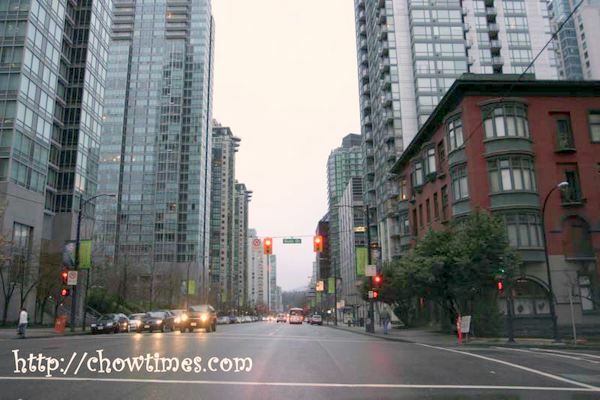 It’s just never ceases to amaze me that I will driving down the heart of downtown Vancouver with high-rises on each side and down the street is the 400 hectare park. Stanley park has millions of tall trees that are hundred of years old. 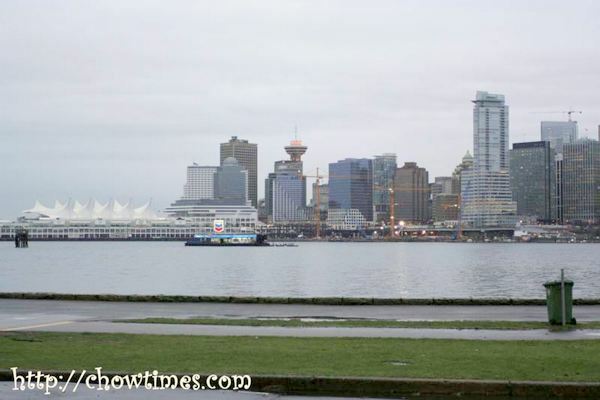 At Stanley Park you have the best view of downtown Vancouver. This is a must stop place for any tourist. Everyone gotta take a picture from this spot to prove that they have been-there-done-that. What I hate about the scenery is the ugly Chevron gas station right smack in the middle of the Coal Harbour. This scenery will undergo some dramatic changes over the next few years once the Shangrila (a new tall building being constructed along Georgia) and the new waterfront Convention is completed. The Causeway to the Lions Gate Bridge cuts right across the park. 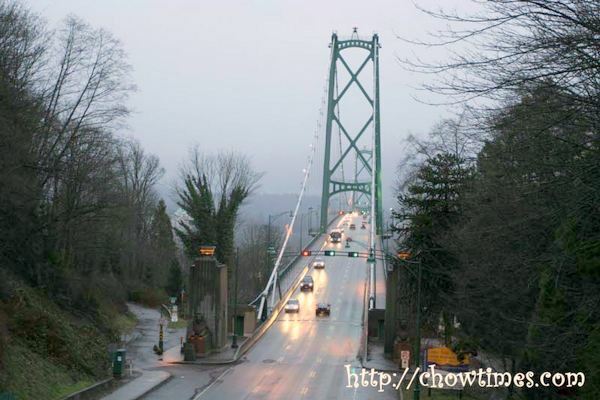 This suspension bridge, built in 1938, is very much a Vancouver landmark as Canada Place and Stanley Park. 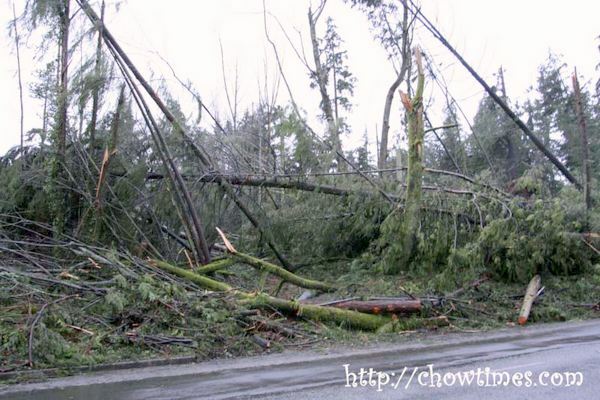 A few weeks ago a huge storm ripped through Vancouver and destroyed quite a bit of Stanley Park. We learnt about the destructions on the TV and in the papers but what I saw in person really broke my heart. I have always seen Prospect Point to be dark and full of trees. You can now see the sky. I heard that it will take $9 million to clean this up. Stanley Park is going to be slightly different but time will heal it. 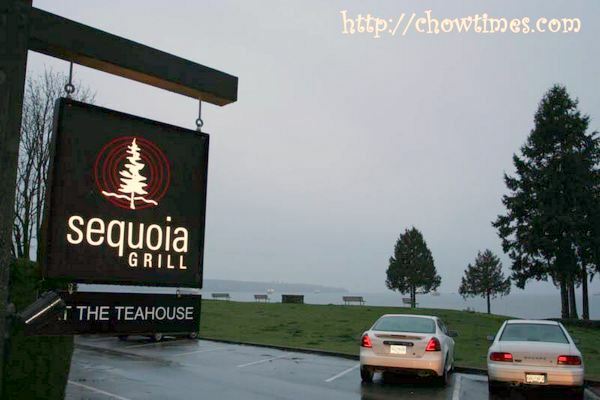 The Sequoia Grill at the Teahouse is located in the western side of the park. 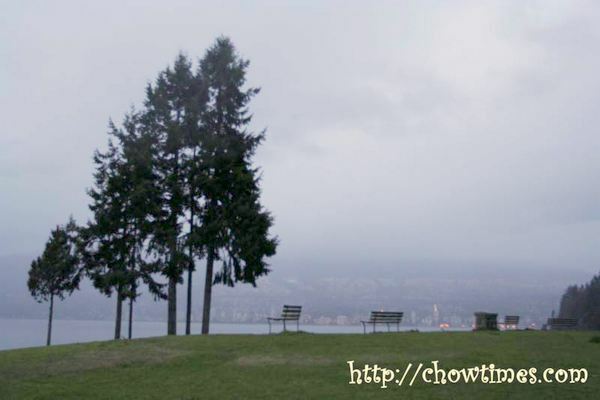 It has one of the best view of the North Shore and English Bay. It was very chilly and dark when we were there but on a warmer day this is a great place to go for a walk after dinner. This place used to be called the Teahouse. They underwent extensive renovation and converted their menus from English teahouse to cater for a more contemporary crowd. There are great views all around with large windows out in the direction of the waters. The Sequoia Grill is surrounded by tall sequoia trees. 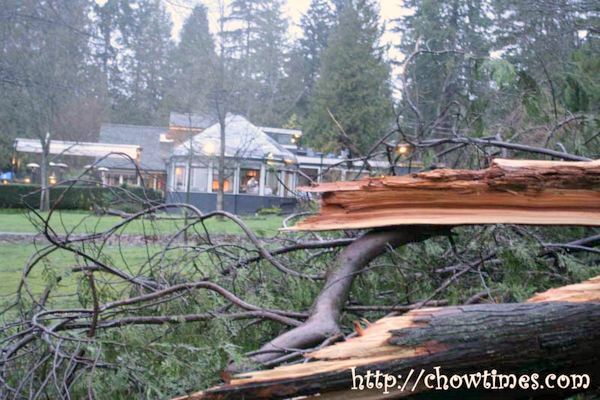 Many trees fell all around the place but the restaurant was not affected. 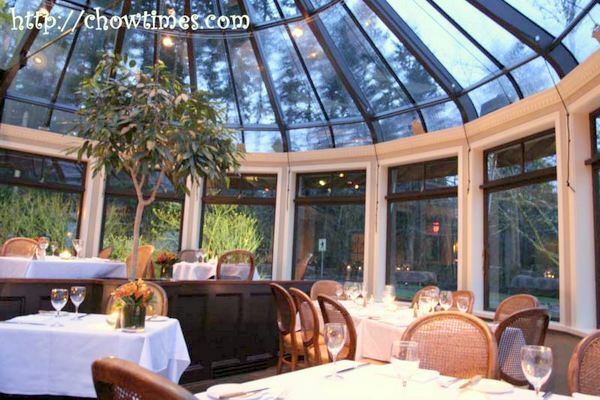 We saw that there are three separate dining rooms — each with it’s own fireplace. 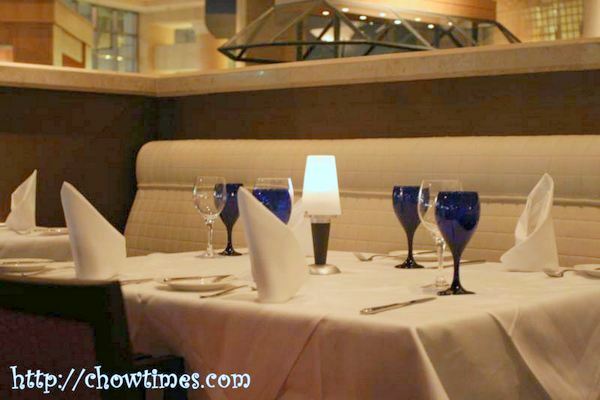 We were early again and were ushered to a great table by the window with a great view of the ocean. Windows all around. Even the roof is glassed. Its setting is dim and romantic with a great view of the sea. One thing though, this place was really noisy once it is filled. On to the food. When we booked for this place, they had their $25 fixed price menu on the website. 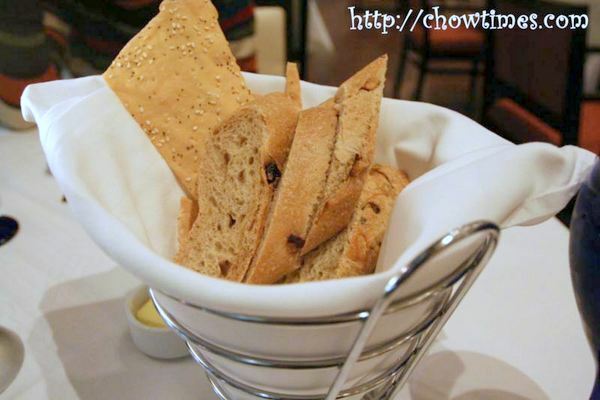 However, we were presented a menu with an option of either the $25 or the $35 menu. We chose the $35. It started with the usual bread. They were served warm and is really flavourful. They have a nice crunch to the crust. They were so good that we asked for more. 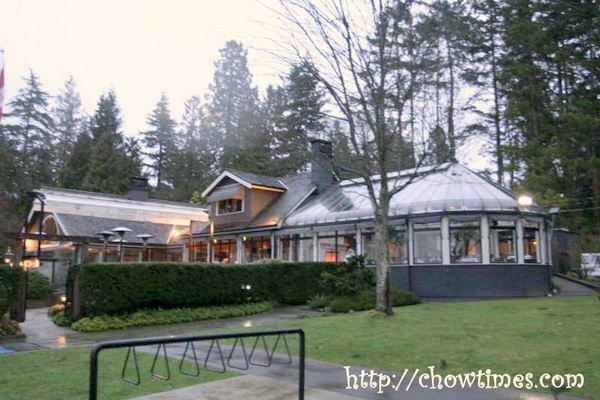 For appetizers, Suanne had the Teahouse Mushroom. 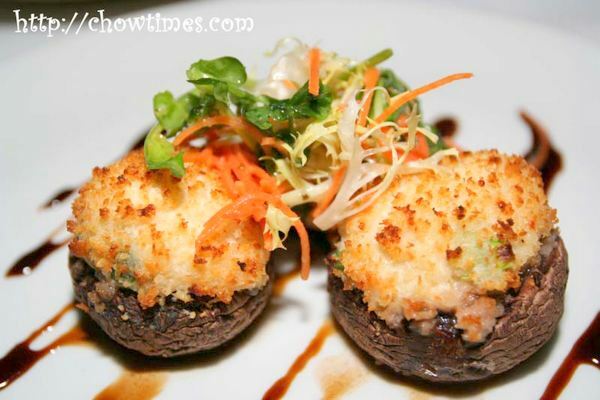 There are three pieces of large mushrooms, each of them stuffed with crab, shrimp and mascarpone. The stuffings were baked and crispy. The Dine Out Vancouver 2007 event is held from January 19th to February 4th. One can enjoy delectable three-course prix fixe (fixed price) menus at some of the hottest restaurants for $15, $25 or $35 per person. We went to only one event last year (see here). This year we planned for quite a few. 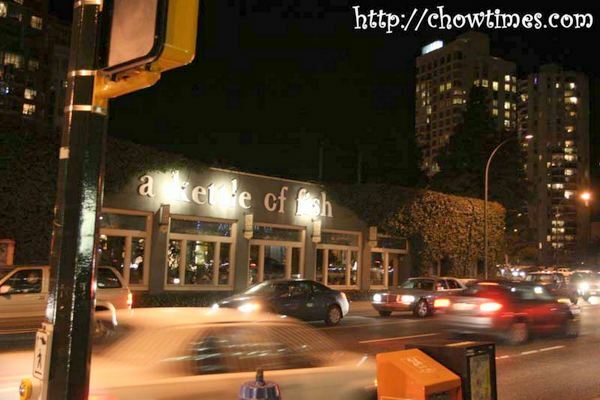 This is our series on Dine Out Vancouver 2007. 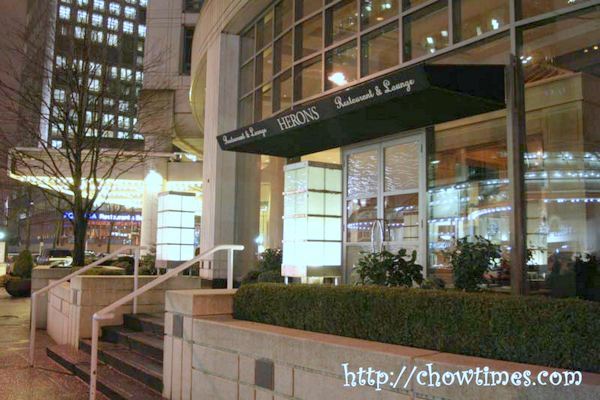 The first restaurant we went to was the Herons Restaurant and Lounge. 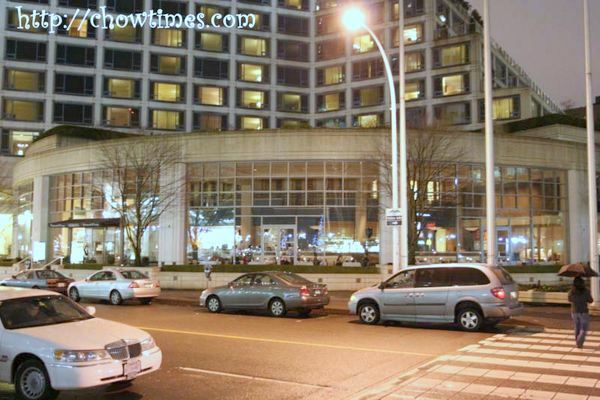 It is at the Fairmont Waterfront Hotel which is located just across the street from Canada Place. Locating the place is easy but finding an affordable parking space is not. Count on paying something like $10. We booked for a table two weeks in advance for a 5:30pm seating. We have never been here before. 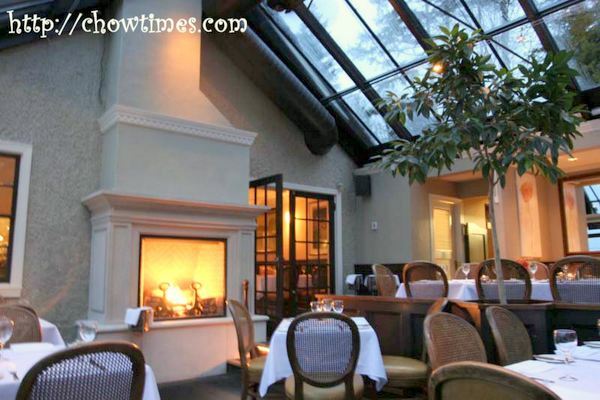 Herons is quite large with tall ceilings and windows all with a view … of the street! They opened at 5:30 pm for dinner. We were the first there. Table setting were elegant. We noticed that even the table cloth is embroidered with the Fairmont Hotels logo. The service was prompt and attentive, despite the fact that we are one of those “water only” customer. I always hated to see the service change when we did not order drinks. This place is different. 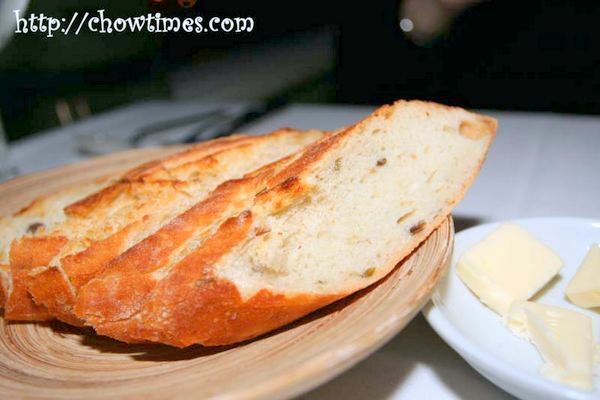 We started off with the usual basket of bread. The butter was perfectly soft. 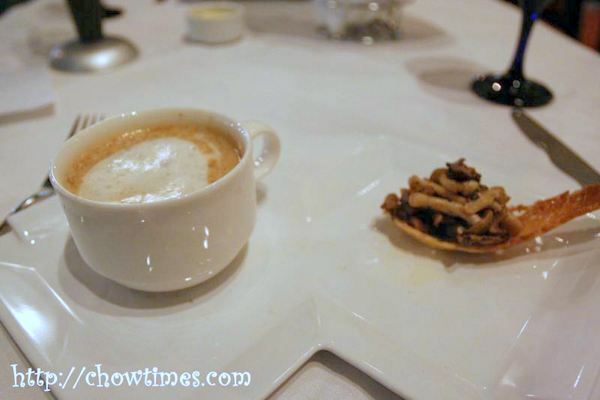 For appetizers, I ordered the Wild Mushroom Cappuccino. This is served in a unique dual plate — with one “cappuccino soup” and the other a brioche shaped like a spoon with warm mushroom salad. 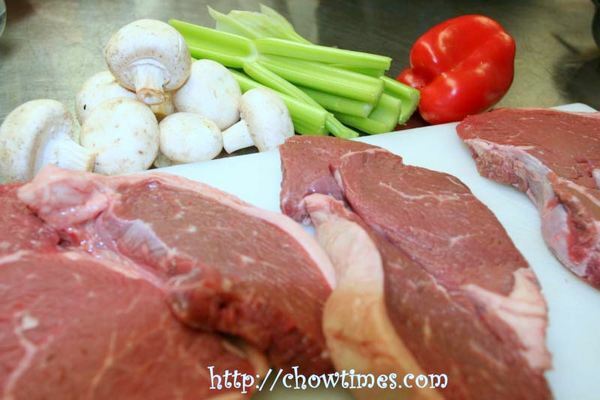 Yvonne’s second dish is Szechuan Pork Chop or more likely as Spice Salt Pork Chop. 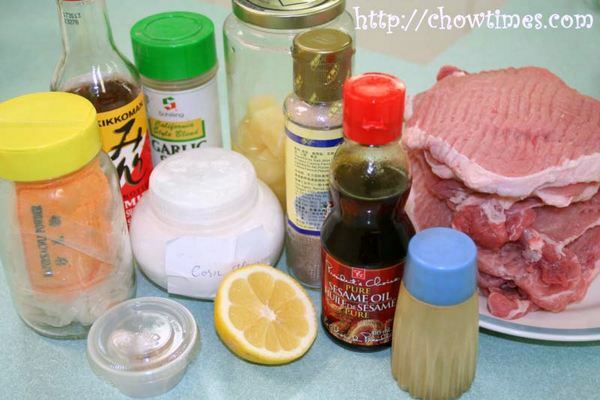 Yvonne got a great deal from a grocery store which offers buy one get one free pork chop. She made a big platter of Pork Chops. 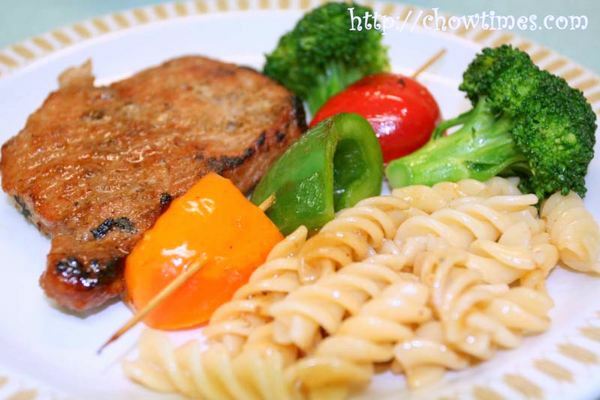 The Pork Chops were served over Fusilli pasta and fried skewered sweet peppers and steamed brocolli. The drippings from the baking of the Pork Chops made a great sauce for the pasta. Yvonne also made a sweet potato and yam soup as dessert. I love dessert soup. Yvonne made two dishes in the South Arm Community Kitchen. Yvonne is an experienced cook. She worked in many places before like Pizza place, factory which supplied food concentrates to restaurants, etc. She also attended cooking schools in her early days in Vancouver. She is a lady with many talents. 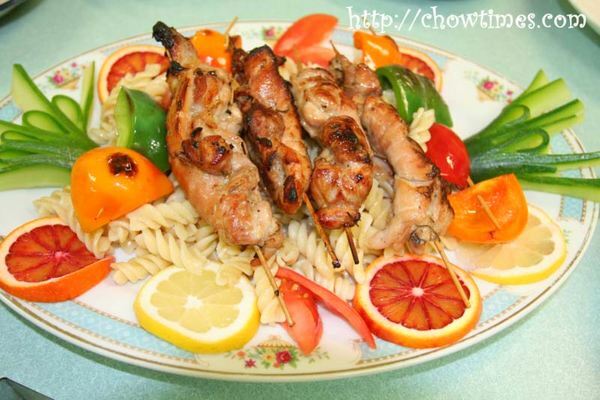 One of Yvonne’s dishes is Skewered Chicken. 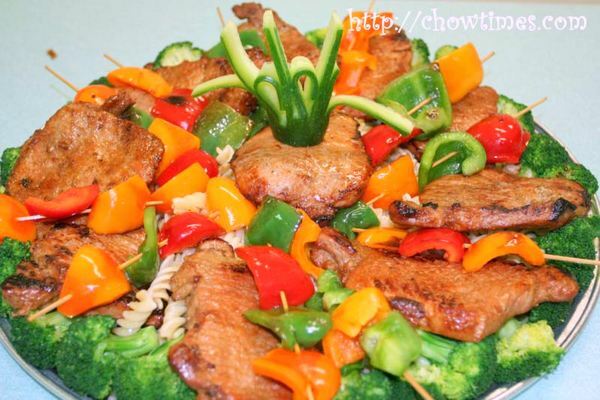 She served the Skewered Chicken on Fusilli pasta and accompanied with Skewered Sweet Peppers which has been briefly fried. Yvonne is a person who emphasized on presentation. She presented her dishes with garnishes using cucumber, tomatoes, blood orange and lemon. It certainly made the dish more appealing. Jean’s second dish is a very kids friendly dish. It is Oven-fried Parmesan Chicken. I know, Arkensen will absolutely loves this dish as he loves fried chicken and Parmesan cheese. 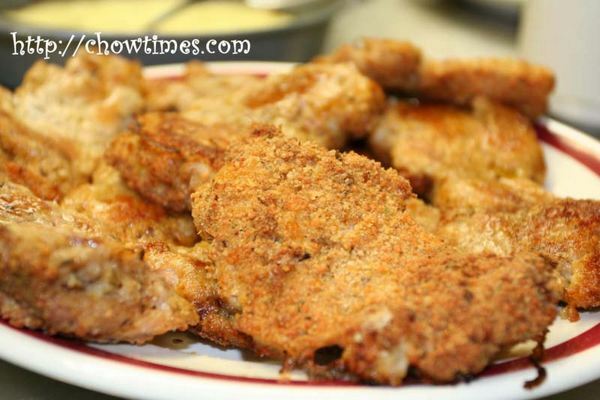 The Oven-fried Parmesan Chicken is a wonderful dish for picnic. 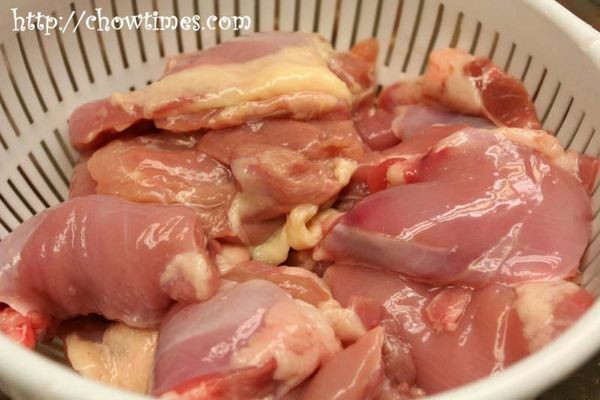 Its not messy and transports well after the chicken is chilled and kept in an insulated container with ice packs. 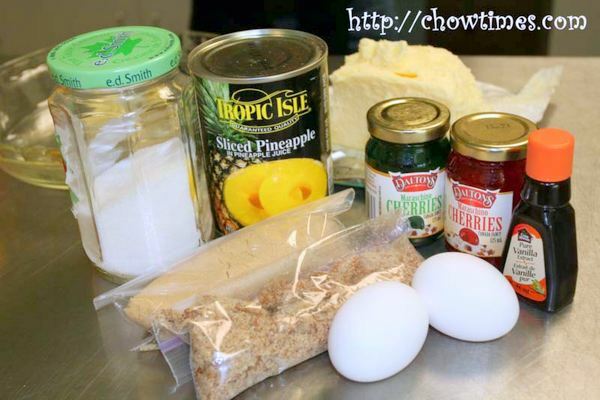 You may even use this to make chicken burgers with some mayonnaise, sliced tomatoes, shredded lettuces and sliced onions. 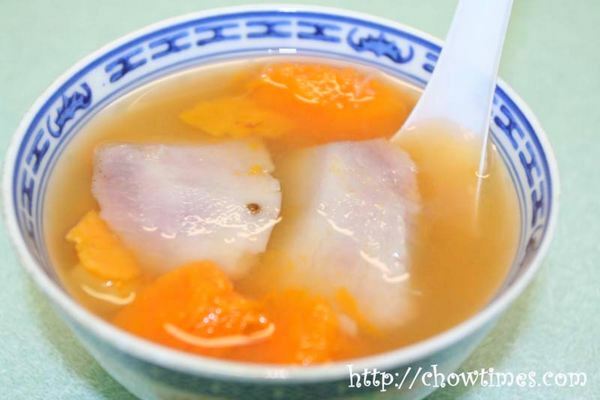 Jean used boneless and skinless chicken thigh which is more flavourful and moist. Jean started off her Gilmore Park Church community kitchen with two meat dishes. 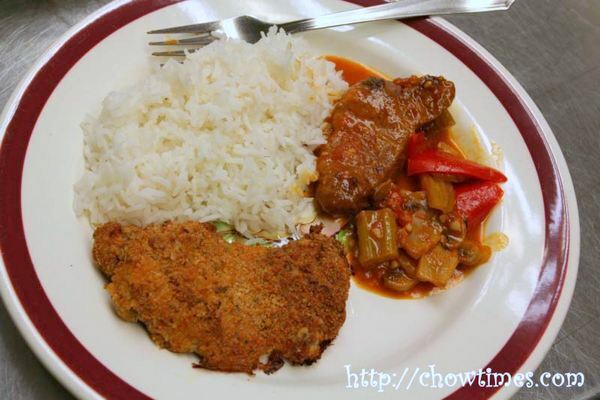 She made Swiss Pepper Steak and Oven-fried Parmesan Chicken. Jean is a good leader by showing a good example in leading the cooking class. I noticed that many of the members of the cooking clubs are very humble and quite shy to show off their cooking skills. It is always a challenging task to fill up the schedule of who to demonstrate in the coming cooking class in the beginning of every session. Nevertheless, the schedule has been filled up to April and its a good start. Well, back to Jean’s dishes. The Swiss Pepper Steak is a great one pot dish which is even better when eaten the next day for the flavour to mellow. 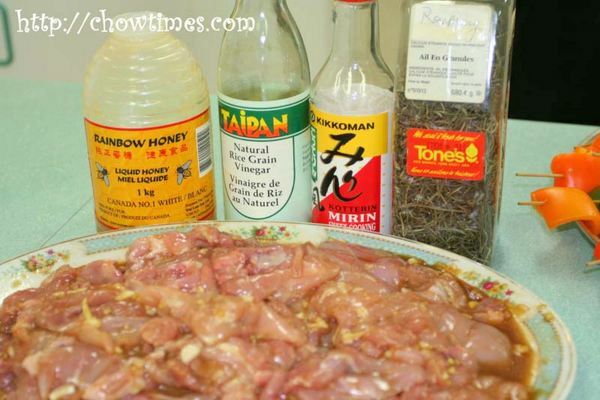 It uses the less expensive cut of meat as the long and slow simmering will break down the tissue of the tougher cut of meat. I just found this very interesting YouTube video on eating sushi from this site. I just gotta share it. Enjoy! 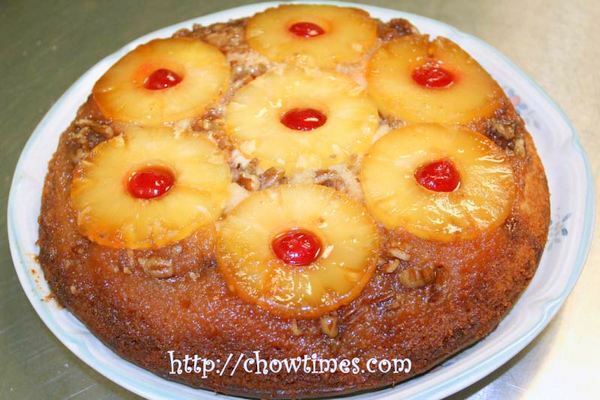 While Minoo was making the Clam Chowder, Jean was busy preparing her Pineapple Upside-Down Cake. Both of them have to do their demonstration at the same time because the cake needed one hour to bake while the Clam Chowder needed time for simmering. I had to run back and forth to both stations to take the photos of the processes. It was a quite a busy morning for me. 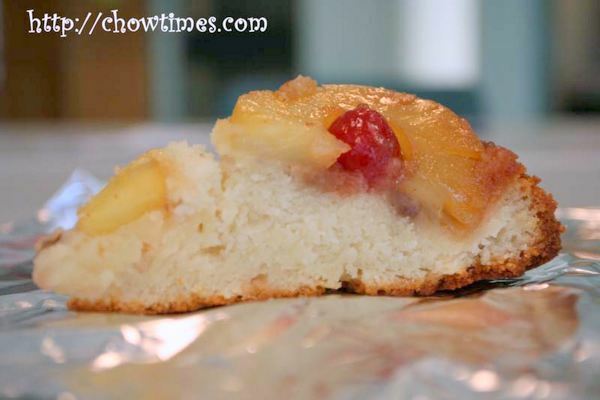 The Pineapple Upside-Down Cake was very pretty when it was turned upside down onto a plate. It is certainly a great recipe for potluck. 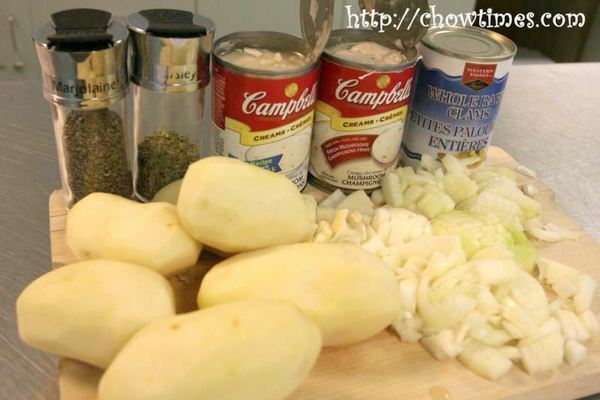 Minoo started the cooking class in Caring Place for year 2007 with a popular soup, Clam Chowder. 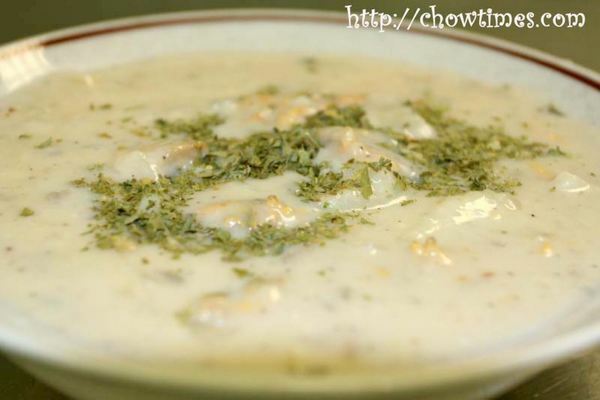 Minoo’s recipe is a simplified version which uses Cream of Mushroom Soup to gives the Clam Chowder its creaminess. Minoo’s recipe is perfect at this time of the year. Vancouver had been unseasonably cold these days with quite a few days of snow storms and sub-zero temperatures. 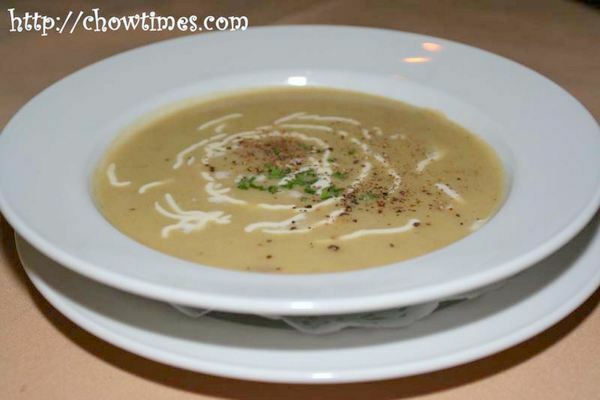 What is better than a hot bowl of soup in this cold winter?